WELL-known Skerries man Joseph ‘Jock’ O’Connor of the White Cottages B&B on Balbriggan Road had a young male ‘Common Seal’ named for him after coming to its rescue when it was spotted acting as if ill or injured near the Springers on Red Island. 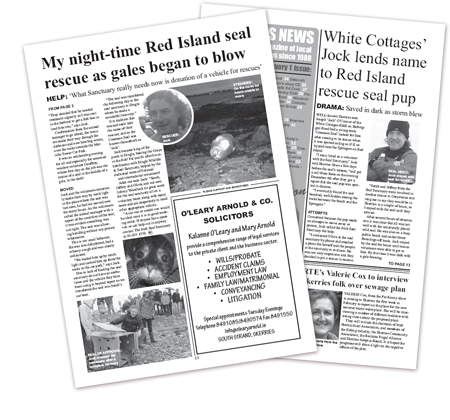 “I am a listed as a volunteer with the Seal Sanctuary,” Jock told Skerries News a few days before the seal’s release, “and got a call from them on the evening December 4th after they got a report that the seal pup was spotted in distress. Concerned because the pup made no attempts to move away or protest, Jock called the Irish Seal Sanctuary for help. “I contacted Olivia at the seal sanctuary by phone and emailed a photo for herself and the people at the sanctuary to evaluate. He was not very responsive and they decided to put a rescue in motion. “Sarah and Jeffrey from the Seal Sanctuary were involved in another rescue in Greystones and rang me to say they would be in Skerries in a couple of hours, so I stayed with the seal until they arrived. After several hours of observation it was clear that all was not well with the unnaturally placid wild seal. He was also on a busy public beach and under threat from dogs off leads. Jock stayed by the seal for hours until rescue volunteers were able to get to him. By this time it was dark with a gale brewing. “They decided that he needed treatment urgently so I was sent to the harbour to get a fish box to load him into,” says Jock. Confirmation from the animal manager to go ahead, the rescuers made their way through the darkness and now howling winds, over the rocks towards the Martello Tower Car Park. It was an exhilarating evening for all and especially for seasoned resident volunteer Geoffrey, whose first day on the job was the rescue of a seal in the middle of a gale, in the dark! Jock and the volunteers tentatively made their way by torch light to the place where the seal was last seen, he had not moved now for many hours. As the volunteers called the animal manager with a report of the condition of the seal, it was evident something was not right. The seal was allowing handling without any protest whatsoever. This is not usual behavior, He was also dehydrated, had a wheezy cough and was clearly exhausted. “We loaded him up by torchlight and carried him up from the rocks to the car park,” says Jock. Due to lack of funding the seal sanctuary do not have an ambulance and the vehicle they have been using is beyond repair so we transferred the seal into Sarah’s car boot. It is tradition that rescued seals take the name of their rescuer, and so the Common Seal was known thenceforth as ‘Jock’. Jock became king of the pools in Dingle, beating the Greys to the fish! Fat and fit after his rehabilitation with Dingle Wildlife & Seal Sanctuary, helped by the dedicated team of National and international volunteers! Adds our man Jock: “Sarah, Jeffery and Olivia and our own Johnny Woodlock do great work for the seal sanctuary all on a voluntary basis along with many more and are desperately in need of an appropriate vehicle. “A car van or combi van would be ideal once it is in good working order. If anyone has a spare van or can help out in anyway contact The Irish Seal Sanctuary at 01-835 4370.